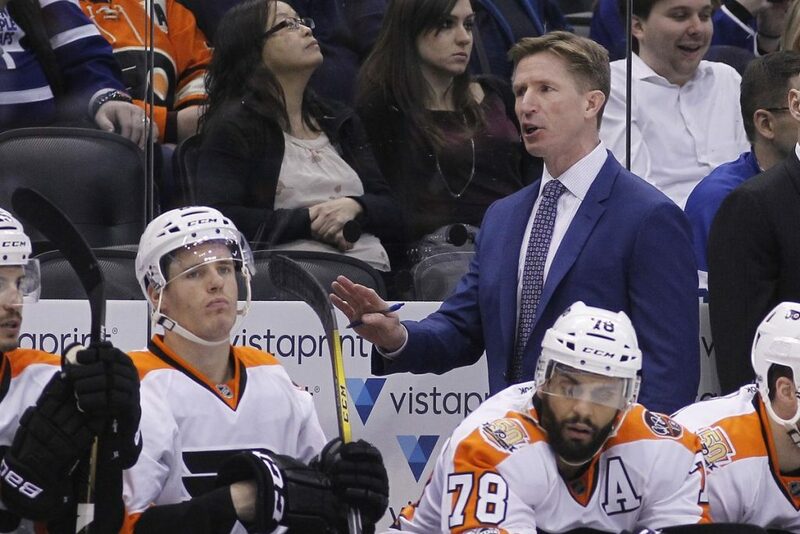 The question has yet again come to surface for our Philadelphia Flyers – Is it time to fire head coach Dave Hasktol? The Flyers got off to a dreadful 4-7-0 start including a stretch of 3 losses in which they were outscored 13-2 (sad and pathetic). It’s really hard to figure out what is going on – whether it’s the offense not scoring, the defense getting thrashed or the goaltending being a complete disaster. Regardless, It all falls on head coach Dave Hasktol and his inability to make changes during a game. You might as well accept that if the Flyers fall behind early, chances are they are not coming back. And thanks to a genius general manager at the time (Paul Holmgren) the Flyers have big named players locked into ridiculous high cap numbers which makes them damn near impossible to move. For example (thanks to CapFriendly.com for the numbers) Claude Giroux’s cap hit is 8.28 mil for the next 4 years, Jake Voracek 8.25 mil for the next 6 years, Andrew McDonald 5 mil for 2 more years. The list goes on and on, with the team paying for underachievers. It is so hard to make trades in the NHL anymore cause of the cap but something has to be done with this team or sadly we are in for a looooong season. If the players aren’t to blame, then maybe it is the system in which this college coach is trying to run at the NHL level. Sorry Coach but it doesn’t work… and you just need to go show yourself that door and….close it behind you… If Ron Hextall is just going to sit there and not address this matter than he might want to find himself a new job as well…same door, pretty simple Ronny. Say they do fire Hasktol mid-season; what avenue do you approach for an interim head coach? Do you stay within the coaching staff and give Ian Laperriere a shot at head coach or do you go after a proven coach in Darryl Sutter (who is currently retired), or Joel Quenneville (recently fired). Hextall has previous success with Sutter as they won the cup together in Los Angeles in 2011-12 and then again in 2013-14. 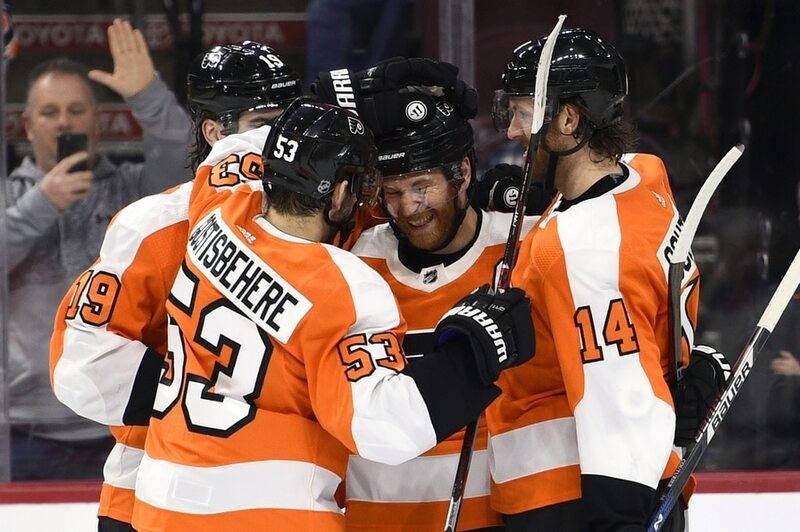 The Flyers are usually a gritty team (hence the new mascot named Gritty – which is still the product of children’s nightmares…) but this year this team is just flat and very inconsistant. Granted injuries in every sport play a major role in how your team performs and the Flyers are missing some key offensive guys, such as newly signed returnee James van-Riemsdyk and Michael Raffl. However, even if we had those guys, I don’t see this team improving much on offense. In previous years, you would have that guy in your lineup who would spark your team and get into a scrap to try and build or flip momentum… but this year they just don’t have that player – or at least he hasn’t shown up yet. Youngster Travis Konecny has shown in his first two years that he can be that guy, but he has yet to make an impact this year. The Wayne train started off hot this season but has been non exist as of late. He’s in a contract year so hopefully he shows up soon. And you know you’ve hit rock bottom when your captain has a minus 4 rating. Overall I am just shaking my head about the offensive output right now. If poor offense isn’t enough should I dare to talk about how horrible the defense has been on this team. First, I must ask if we can please find a way somehow to get rid of Andrew McDonald. He is by far the worst defensemen in the NHL and shouldn’t even be on an NHL roster. Whether he is out of place, not involved when he is supposed to be or simply just being Andrew, please please please just keep him off the ice. You can’t solely put the blame on him cause your two best defensemen are also struggling (Provorov and Gostisbehere) with a combined minus 16 through the first 11 games. Head scratcher for sure. The defense does show promise with the play of youngsters Robert Haag and Travis Sanheim but two defensemen are not going to win you anything in the league today. Offense and defense are key roles on any team in any sport, but honestly the most important position in hockey is the goalie. Right now the Flyers goalie room is an absolute disaster and is becoming painful to watch every night. As of now the Flyers goalies as a group are averaging 4.71 goals allowed per game. Brian Elliott who is supposed to be your starting goalie is a mere 2-5 with a 3.39 GAA and a .886% Sv%. That is our starting goalie right now ::claps sarcastically:: and if that’s not bad enough, behind him you have journeymen Calvin Pickard who was claimed off waivers before the season to fill in for often injured goalie Michael Neuvirth who made his first start on Saturday, October 27th and got LIT UP by a Islanders team when he gave up 6… (yes 6 goals)… on just 22 shots. Granted the Flyers have supposedly their future goalie in Lehigh right now in Carter Hart, but everyone’s question still left unanswered is when will we see the kid in an NHL game that actually means something. Please Flyers fix your problems rather if its replacing Hasktol, changing the gameplan, or blowing this team up and starting over. We have a future I get it but like me your fan base is running out of patience and confidence in you guys. We want to win and we want to win NOW!! !